Considering the large number of surviving examples of Civil War period vernacular photography, relatively few are group portraits. This may leave an impression that singular individuals fought the war’s great battles, and this is true on a micro level, for the history of the Civil War is the stories of its soldiers. Yet we know from letters, journals, and other first-hand accounts that bands of brothers were linked by strong bonds and esprit de corps due to their pre-war connections, patriotism, sense of duty, and shared military experience. This gallery pays tribute to all Civil War comrades in arms and celebrates the photographers who recorded their likenesses. The twelve featured images are also part of my Flickr Faces of War Collection. For those who desire to learn about the Civil War from the perspective of the soldier in the trenches and the combat officer on the front lines, those interested in old photos of veterans, and those looking for an alternative to other museums and attractions in Gettysburg, Ronn Palm's Museum of Civil War Images delivers. Located on Baltimore Street, Ronn's museum contains a wealth of photographs and other relics from the Civil War years, all arranged on walls and in cases that allow visitors to get up close and study each and every artifact. This is Ronn's way of remembering those who served, and he's created a space that puts soldiers first. Especially his beloved Pennsylvania Bucktails, with their distinctive forage caps, They fought with distinction on many a battlefield, including the hallowed ground all around the museum. Two cartes de visite stood out for me: A solder seated in a photographer's makeshift tent studio, supplies stacked all about him, and a Pennsylvania artilleryman holding the Stars and Stripes Both are stunning examples of wartime portrait photography, and examples of what makes Ronn's collection one of the very best in the country. I will be dedicating serious research time to a third carte: Silas L. Johnson of the Ninety-Sixth United States Colored Infantry (USCT). Also known as Silas Brown, the Mississippi-born former slave sat for an unidentified photographer sometime in 1864 or 1865. According to the 1880 census, his parents were born in Virginia. I am indebted to Ronn for his generosity and kindness, and for the inscribed copy of his book, Pennsylvania Bucktails: A Photographic Album of the 42nd, 149th & 150th Pennsylvania Regiments. On your next visit to Gettysburg, make time to visit the museum. It is a memorable experience. I've had this carte de visite in my collection for years. The only clues to the identities of the subjects: A modern pencil inscription noting that it had been removed from an album of soldiers belonging to the 135th U.S. Colored Infantry, and the photographer's name, J.C. Elrod of Louisville, Ky. Recently I began working on an article for a future issue of Military Images magazine. The working title, "Comrades in Arms," headlines a survey of a dozen cartes de visite of soldiers posed in groups of two to six. 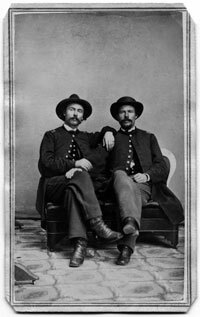 The image of this pair of officers from the 135th was on my list of photos to definitely include: The quality and contrast of the print is excellent, age toning minimal, and the casual pose of the men is uncommon. In preparation for writing the caption, I researched the 135th and found that its brief term of enlistment (March to October 1865) began in North Carolina and ended in Louisville, Ky., where this image was taken by the photographer Elrod. This detail fit nicely with the modern pencil note on the back of the mount. Next, I searched the USAMHI Old Civil War Photos Database. The results included three men from the 135th, all officers. I requested photocopies of the images. Reference Historian Art Bergeron responded promptly, and I received the copies in yesterday's mail. One of the images, a bust view of 1st Lt. and Adjutant Horace S. Bradley, is without a doubt the same individual seated on the left of my carte de visite. The facial features and mustache are identical, and both wear the same close-fitting hat, patterned tie, dark military vest, and leather straps. Preliminary research reveals that Pennsylvania-born Horace Seymore Bradley (1833-1892) served in the Fifteenth Illinois Infantry before joining the 135th. His brother-in-law, John Edgar Gurley, served as the colonel of the 135th. I would like to identify the man seated next to Bradley. My first thought was that it may be Col. Gurley. However, this man wears the shoulder straps of a captain. Gurley was originally a captain in the Thirty-third Wisconsin Infantry, but by the time of this sitting would surely have worn the shoulder straps and uniform coat with two columns of brass buttons that befit his rank. Check out the image on Flickr. Perhaps you know who he is.